The PIN module of SFARI Gene serves as an up-to-date reference for all known direct interactions occurring between gene products implicated in ASD. Studying the many interactions that take place between proteins is crucial to understanding their functions. Published data related to an individual protein are manually reviewed and verified by our researchers. Once the evidence has been analyzed, the proteins are added into the module and organized into genetic categories. Users can browse all the data contained in the PIN module with the new Ring Browser tool. When users enter the PIN module, all of the curated genes are displayed along the outside of the ring. When users hover over a gene, any protein interactions associated with that gene appear in the center of the ring, connecting the two genes linked by that particular interaction. The table below the Ring Browser contains a list of all protein interactions contained in the database. The Quick Search function at the top of the table can be used to filter the data displayed to help users find the data most relevant to their search. Data from the module is also accessible via the Human Gene module. If a protein interaction has been observed for a particular gene product, it can be found in Protein Interactions tab on that gene’s summary page. The Ring Browser is used to visualize every known protein interaction that takes place between gene products associated with ASD. 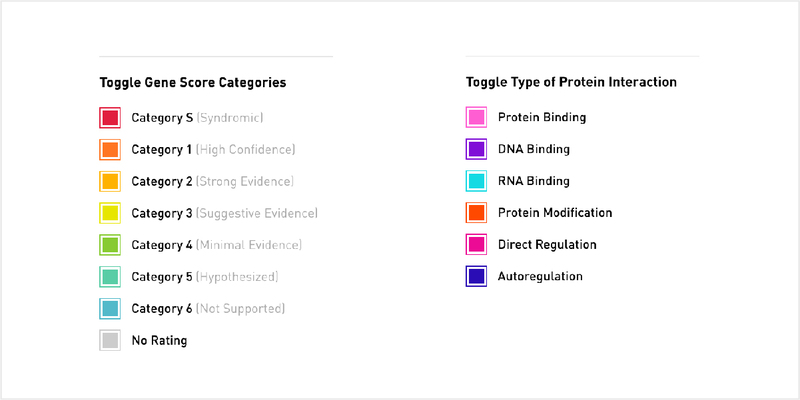 Toggles to the left of the Ring Browser allow users to filter the data by chromosome, the type of interaction (DNA binding, protein binding, direct regulation, protein modification, autoregulation, and RNA binding) or gene score. When users hover over a gene on the outside of the ring, the interior of the Ring Browser illustrates the connections between interacting proteins, using different colors to denote the specific behaviors linking each protein. Clicking on a gene will take users to its dedicated gene summary page, where additional information about protein interactions can be found under the Protein Interactions tab. 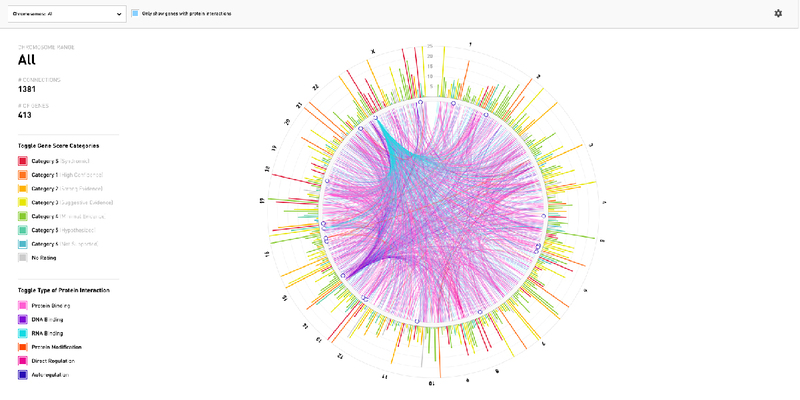 The data is also displayed in the new interactive interactome feature. Found on the gene summary page, the updated interactome diagrams all protein interactions for that gene product and allows users to click on any interaction to see what other genes are connected by that protein. Information on the various protein interactions occurring between gene products has been refined and more thoroughly integrated into the other modules of SFARI Gene. Every gene entry in the database contains a searchable table of protein interactions and an updated, interactive interactome model. For more information on how data from the PIN module is displayed on the Ring Browser, please view the Data Visualization section above. For more information on the new interactive interactome model, please see the Interactome section below. Data from the PIN module can be found by using the full site search in the top navigation or the Quick Search or Advanced Search tools. The Quick Search tool below the Ring Browser can be used to immediately filter the content of the table. The table is dynamic, updating the information displayed as the user types. The Advanced Search tool, located on the Tools page of SFARI Gene, searches the entirety of the database, including all information contained in the PIN module. SFARI Gene 3.0 now contains an interactive interactome feature that helps users more clearly see the interconnectivity between gene products associated with ASD. 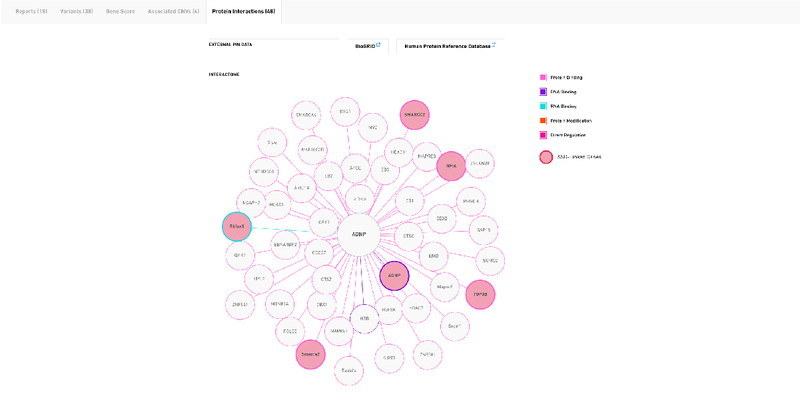 Under the Interactome tab on any gene entry of SFARI Gene, users can see a diagram of all known protein interactions associated with that gene product, whether they are linked to ASD or not. Proteins associated with other gene products contained in the SFARI Gene database appear as active links that will take users to other gene entries. Users can also filter the information highlighted in the Interactome by the type of protein interaction using the toggles on the right. Beneath the Interactome in the Protein Interactions tab on every gene summary page, users can find a table that contains all known protein actions of that particular gene product. The following information can be found about on the interaction table: the symbol assigned to the interaction, the interactor name, the interactor organism, the type of protein interaction, the type of interactor, and the interaction’s Entrez and UniProt IDs. Most of the primary references were found through the manual curation of published articles, making it an integral step in the identification and extraction of information regarding ASD protein interactions.